It's called the Venise de Provence (as is L'Isle-sur-la-Sorgue). That might be a bit of an exaggeration, but colorful houses shoulder-to-shoulder along the boat-lined canals do give the island part of town a Venise "look and feel". On the hilltop above the town to the north, a restored windmill [photo 9] adds a nice touch.  Market day Tue, Sun. The town sits astride the Canal de Caronte connecting the Etang de Berre (Berre Lagoon) with the Golfe de Fos and the Mediterranean. Although this large town has expanded to suburbs, the old central part is very pretty and very active. The entrance canal splits around an island at the edge of the Etang. As recently as 400 years ago three separate villages joined into a single commune, but the three parts (L'Isle - the island; Ferrières - north; Jonquières - south) retain their individual characters. L'Isle is formed by the main channel splitting into the Canal Galliffet that enters the Etang beneath the new drawbridge, and the northern Canal Baussengue, now blocked by the ancient (1853) swivel bridge [photo 8]. The "Venise" part of Martigues is really the Canal Saint Sebastien that runs down the middle of the island and exiting into the Canal Galliffet. Ferrières, north of the island, has a compact little old town, less picturesque than the other two centers. Along the side of the Etang, though, is a nice park and beach area, and the municipal swimming pool is here. Jonquières, south across the new draw bridge, has an excellent collection of markets and shops in a maze of small streets and pedestrian zones, especially along the rue Lamartine that runs past Place Gerard Tenque and through the old buildings. Along and around the Cours du 4 September is a good place to find terrace cafés and restaurants. All three parts of town have a mixture of narrow little streets and pedestrian walking and shopping areas. L'Isle is more picturesque than Ferrières, and Jonquières has the best collection of shops and markets. Each of the three parts is accented by its own steeple. North and south are tall narrow stone steeples, from the Eglise Sainte Louise d'Anjou (1650) of Ferrières and the Eglise Saint-Géniès (1625) of Jonquières. On the Island, the large, buttressed Cathedrale de la Madeline is topped by a short square clock-bell tower. Prehistoric: Neolithique huts were discovered at La Couronne, and a tumulus at Ponteau. Gallo-Roman: At the Place Martima on L'Isle, a multi-room dwelling of the Gaulois du Midi is presented behind glass walls. This excellent display is built on the site where the stone walls and artifacts were discovered. An important Gallo-Roman bas-relief is at the chapelle St-Julien. Medieval: Jonquières had a priory belonging to the monks of the Abbey de Montmajour. An 11th-century chapel on l'Isle was founded by Gérard Tenque for the Hospitaliers de St-Jean. This is not hiking country. The Chaine de l'Estaque is a low range of hills southeast of Martigues, running along the coast towards Marseilles, where you'll find some forestry roads and trails. Otherwise, you might have a look at the Camargue for better seaside walks. Regional restaurants specialize in seafoods, with Marseilles-Camargue-Provence styles. Nearby restaurants on the Island recommended to us were Chez Marraine, Hostellerie Pascal, Le Bouchon à la Mer and Le Mirroir. We tried La Petite Venise, by the cathedral, with its terrace on the canal at the Mirroir des Oiseaux. The building is classed a Monument Historique (like the rest of the neighborhood), and has been in La Patronne family for three generations. We found good food, reasonable prices, a good selection of regional wines, and extremely friendly service . They had 95 F and 125 F menus, with less expensive weekday possibilities. The Salade Fruit de Mer was a large plate with lettuce, oranges, grapefruit, tomatoes, cooked garlic and parsley, shrimp, filets de rougets and noix de coquille de St. Jacques. The Canard à Sauce Miel was duck in honey sauce, flambé in Armagnac, with a few green pepper seeds to counter the sweet honey from the Alpes de Haute Provence. Archaeology, ethnography and 19th-20th century Provençal painters. 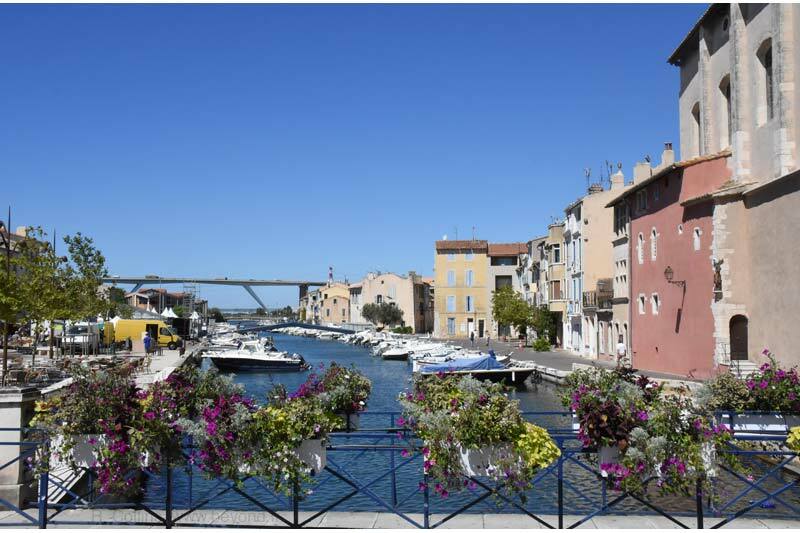 Excursions on the canals of the "Venice of Provence", the Frioul islands and the gateway to the Camargue. St-Chamas, Berre, Rognac, Vitrolles, Pas-des-Lanciers, Istres, Rassuen, Fos-sur-Mer, Port-de-Bouc, Crois-Sainte, Martigues, Ponteau-st-Pierre, La Couronne, Sausset-le-Pins, Carry-le-Rouet, La Redonne-Ensuès, Niolon, L'Estaque, Séon-St-Henry, St-Louis-les-Aygalades, Le Canet, St-Barthélemy. Miramas is on the Marseilles-Paris rail line, with stops at Arles, Tarascon-sur-Rhône, Nimes, Clermont-Ferrand, Paris. Marseilles, Aix-en-Provence, Saint Cannat, Lambesc, Pélissanne, Salon-de-Provence, Miramas, Istres, Fos-sur-Mer, Port de Bouc, Croix Sainte, Martigues.